Commencing this Friday, 30 November, Patches of Heaven in Temora is celebrating their 10th Birthday. 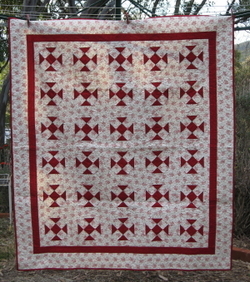 To kick the celebrations off there will be a quilt display Friday, Saturday & Sunday. 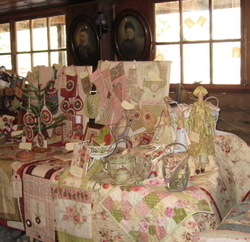 You'll be able to wander through the B&B accomodation and teaching room to view the quilts. Helen's told me there will be 'wickedly decadent dessert' available on Friday. And there will be SALE! I made these today to help Helen celebrate. Love them in the pretties. 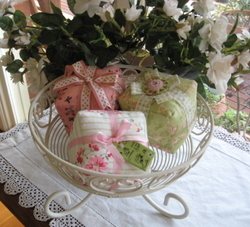 I wasn't sure what colour ribbon to use on the pink gift. I found a rather ugly striped print and fussy cut it. Just can't believe how good it looks. 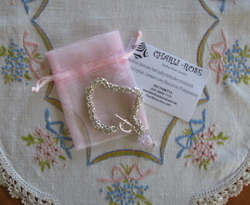 It's a GIrl Thing tag looks wonderful tied to the present. I'll be there on Friday with my display. Would love to see you there. A slow day today, well it is Sunday, but I have finished my cat mat. My favourite projects are those that can be finished easily in a weekend. 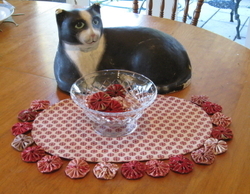 I made the Yo-Yos on and off yesterday as well as the centre piece and today simply attached the Yo-Yos. The Yo-Yos were made with the large Clover Yo-Yo maker. 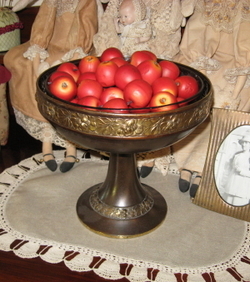 The other day I was wandering through the store Provincial Home Living and found these gorgeous crab apples. I couldn't help but think they would look wonderful for Christmas. They look fabulous in my Nan's fruit bowl. So much nicer than the pot pourri now residing in the compost bin. There are often many projects whizzing around in my head but none that I want to start immediately. So I often drag out an old unfinished project and before long I'm thinking 'Oh I could do this. And this is what happened when I woke up this morning. Just starting on the penny rug somehow led me to this. Plus an overwhelming desire to make something in red and the fact I've been wanting for sometime now to make a mat for my cat. So I've been making Yo-Yos today. How good do they look displayed in the bowl. Looks like I will need to make some spares. This is what I plan to do with them and this is my cat. There was a fabulous homeware shop just around the corner from work and I would often skip lunch for a little bit of retail therapy. The cat sat in the window for a long time before moving to a top shelf in the shop. The shop was closing, the shelves were emptying and still the cat sat there, looking a little sadder each time I visited. 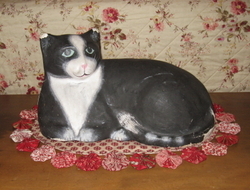 Now I guess some of you are thinking that I should have left the cat on the shelf, but I couldn't. For reasons I cannot explain I really like this cat. Yes it is starting to crack and the ears are a little tattered but I don't see any of this. It crossed my mind, as I was working on this new design, that I might just be a little mad. I've sized it so the cat fits perfectly. 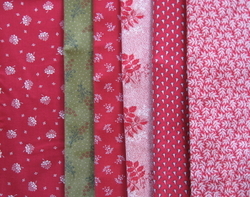 But I've had fun and best of all I have some new ideas for quilt. The last week or so has been so hot. It was 39 (a bit over 100 degrees fahrenheit) on Tuesday. I can think of lots of reasons why I don't like hot weather. So trying a little reverse psychology I decided I would feel much better about these hot days if I could find something positive about them. Now the list I came up with is very short. If you can think of anything, that doesn't involve water activities, please let me know. 2) If your ageing a project with a tea or coffee stain it dries quickly and beautifully in the sun. Place the piece(s) on a cake rack so the warm air can circulate underneath them. This is one of the few times my cake racks are ever used. Today has been lovely and cool. I woke to the sound of rain falling on the roof and the smell of eucalypts. 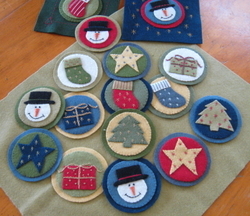 I found these half finished felt decorations I started a few years ago in my work basket. Don't ask me why I made so many. There must have been a plan. But I have decided to turn them into a kind of penny rug for Christmas. Its going to require careful planning as I only have limited felt for the main piece to work with. 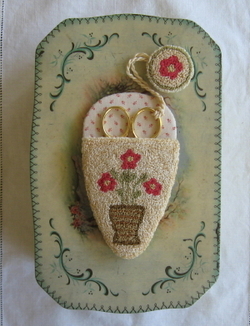 I'm going to use all the appliqued pieces even if the colours aren't quite right in the true tradition of 'making do'. Well after the last two weekends and all the work that went before I have to admit to 'going a bit slow' this week. I was not the only one. 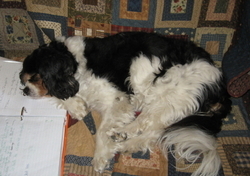 This is what our dog Azzy does best (apart from eating things that don't agree with him, like fabric and satay stitcks). He is very happy to have us home. The kennel doesn't have such comfy accomodation. Much shaking of his head and a very sad look on his face saw us at the vets early in the week. He had a very large and nasty grass seed removed from his ear. This and a small grass fire not far from where I live prompted me to get back into the garden for a much needed clean up. Only about half way, but I can at least see where I've been. The nice thing about going away are the lovely surprises waiting for you on your return. 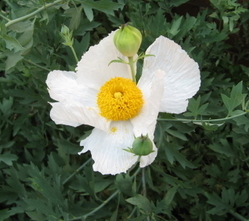 My Californian Tree Poppies have burst into bloom. This is a wonderful shrub. Survives on little water but does like to send out runners and pop up a long way from the parent plant. I've got them coming up between the expansion joints (not sure if this is the correct technical jargon) in the driveway. What I great weekend I had at Warracknabeal. A big thank you to Del and Shirl (Quilter's Harvest) for organising such a wonderful day. Girls travelled from as far as Seymour, Adelaide and Mildura. In the afternoon we were entertained by Danny as he told us snippets of his life story, how the restaurant started and his addiction to collecting just about anything. His tip - to go to as many garage sales as possible. I know that this struck a cord with Jeniffer Knol, Barb and me as we couldn't resist the urge to visit a second hand shop the afternoon before. 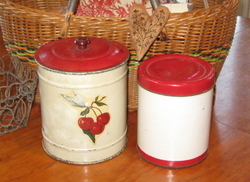 Jennifer bought enamel bowls, tins and even some furniture, Barb a pair of earings, and I couldn't not buy these tins. I'm not sure how it happened but I only managed to take a couple of photos of the weekend. 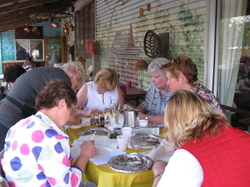 Here's Barb teaching the girls painting. 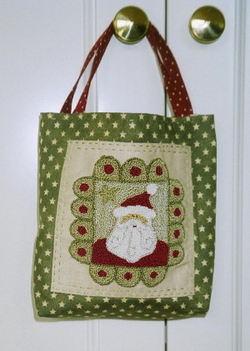 The project - one of Barb's trademark Santas. You can probably make out from the photo just why the venue was called the Rusty Nails Restaurant. My display. I didn't ask Danny if the man and woman in the background were related but after listening to him speak about his passion for collecting I'd say probably not. This is one of my projects. 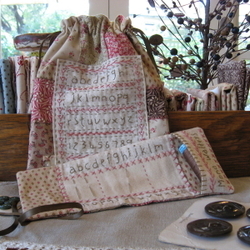 A needle and thread roll with a dilly bag. When Del and Shirl told me the theme for the workshop was a trip down Memory Lane this evoked memories of my Nana. Nana crocheted and worked beautiful tapestries right into her 80's. The colours and decorative stitches reminded me of her. And because I am addicted to needle punch and my old scissor case was in need of an update I thought I'd make a new one. Thank you to all the lovely girls who made the day so enjoyable. This was my first trip to Warracknabeal and the first time I had ever driven so far by myself (just over 500 kms) but I will definitely be heading back for another visit. Early Friday morning (6.00am) Jan & I set off for Sydney. We were headed for Mamre Homestead, St Mary's to spend a weekend teaching with Christine Book. Jan's taught there with Christine the past three years but this was my first time and I was very excited. These weekends have always sounded like a lot of fun. 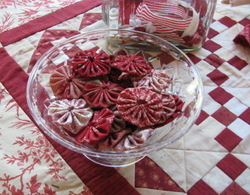 Lots of laughs, great company, a little bit of sewing, yummy food - what more could a girl ask for? Now I couldn't tell you about this weekend before as I was the mystery teacher. While I managed to keep it pretty much a secret, I don't think Christine was so successful. Most of the girls knew I was coming. Christine based the colour theme on the Suffragette Movement - Purple (dignity), white(purity) and green (hope). Girl Power! 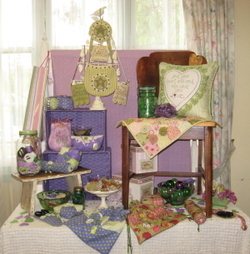 Jan found a great purple and green spot fabric for her projects - drawstring bag, pincushion and scissor case decorated with yo yos Christine designed a lovely cushion with a stitched heart surrounded by heart shaped yo yos, a great bag and some cute purse pincushons. I made a small gift pouch and bag and a needle punch project with a purple daisy in the centre. Our only expectation was for everyone to have a great time and if you went home with a yo yo finished the day was a success. The afternoon was topped off with a truly inspiring show and tell of quilts, bags and some beautiful vintage silk ribbons. I know that Jan and I had a fabulous weekend - not work at all - meeting lots of wonderful girls. Now there will be more photos, Heather and Chris, and I will be posting these in a photo album later today sometime before midnight! So yes they are coming.